A cryptocurrency wallet acts pretty much the same as a regular wallet, like the one you already have in your pocket. Since digital currencies do not exist in a physical form a new type of wallets had to be designed. Digital coins represent bits of data and do not have a physical form of precious metals, for example, gold. Since you can’t see this type of coin, a software solution had been required and that is how cryptocurrency wallets came to life. Since we are dealing with bits of data, the solution had to incorporate a series of features, so that their owner can use them as usual money. Crypto wallets can help you store your digital coins and this article had been designed in order to help you understand how to manage a crypto wallet. We have to mention from the start that crypto wallets do not “store” money in the traditional way. Digital coins cannot be stored. These wallets store your private and public keys and enable you to interact with other users in order to make transactions. A cryptocurrency wallet is a software that can help you store your key, aka your digital money. A crypto wallet is basically a software and this kind of software is usually designed for a particular system. The most popular cryptocurrency is by far bitcoin and almost all wallets have support for bitcoin. When it comes to other crypto coins, you will need to do a little research, since only a few had implemented support for other cryptocurrencies like ethereum, litecoin or dash. Since using a cryptocurrency wallet implies that you use access to the internet, good management procedures will prevent you from being hacked. The first thing to do is to back up your wallet. Keep only a small amount in your e-wallet. Cold storage is much safer and you should take it into account. Keep your software up to date. Wallet providers have apps for mobile phone or desktop and you should constantly keep them updated. The third tip for a better management is to add an extra layer of security. A strong and complex password, doubled by a phone verification or any other second-level verification increases the security of your account and your funds are safe. Make sure that the wallet provider you choose offers you many features and find the best solution for yourself. Remember that storing cryptocurrency could be tricky. That is why we have suggested a cautious approach when it comes to managing your account. Even though cryptocurrency wallets are used on a very large scale, now that the industry had grown tremendously, the vast majority of them do not understand properly how their wallets work, which can lead to a bad wallet management and even some mistakes can could put you in a situation where someone can take away your digital coins. First, because of security reasons, wallets do not actually “store” the digital money you have. All that exists in your wallet represent records of transactions stored on the blockchain. The blockchain technology is considered to be one of the most important technological breakthroughs of this century and had enabled the development of the cryptocurrency world. All digital money and all financial transactions made in a particular system, bitcoin ethereum or any other, are stored on the blockchain. It has a high level of security and cannot be hacked. Since wallets do not actually store the digital money, we can see that cryptocurrency wallets serve as a link between the blockchain and user. This type of wallets is used to interface with various blockchain so users can be able to send and receive money, monitor their balance and conduct many other operations. Let’s assume a particular situation, so you can understand better the purpose of a cryptocurrency wallet. Let’s say that a friend of yours wants to send you some bitcoins or any other type of cryptocurrency, it does not matter very much. What your friend is actually doing when he is sending you money is essentially signing off ownership of the coins. And also, to be able to spend the digital money you have received, the private keys that are stored in your cryptocurrency wallet must match the public address the currency is assigned to. If both public and private keys match, the balance of your wallet will increase with the respective sum, and the balance of the sender will decrease with that particular amount. No actual real exchange of coins takes place. Just a transaction is being recorded on the blockchain and the balance of your wallet changes. There are several types of cryptocurrency wallets, each one of them with its own features, advantages, and disadvantages. Hardware wallets – are very different from software wallets, and their main feature is represented by a strong level of security. As opposed to the software wallet, a hardware wallet stores a user’s private keys on a hardware device, like a USB. The principle is called cold storage and it basically means keeping the cryptocurrency offline in order to ensure a high level of security. That prevents users from being robbed by hackers or any other thief. Among the other features of hardware wallets, we need to mention the ability to support different cryptocurrencies and they are also compatible with several web interfaces. It’s very easy to use them: you simply need to plug in the hardware device to any internet-enabled computer, phone, tablet etc, enter a pin, send currency or make payment and confirm. This is the main feature of hardware wallets, enabling you to make payments in cryptocurrencies, while also storing your coins in a safe environment. Desktop wallets- represent software wallets in the form of an app that can be installed on your computer. Most of the desktop wallets are compatible with all operating systems, be it Windows, Mac OS or Linux. The level of security is not as high as with the hardware wallets. Since your computer is connected to the internet, a malware can harm the functioning of your wallet app, or even copy your private details. It is necessary to ensure a high level of security, with up to date antivirus software and firewall in order to be sure that no one could hack into your desktop wallet. Mobile wallets – are apps designed for smartphones, usually compatible with both Android and iOS systems. Mobile wallets have a series of additional advantages, as compared with the desktop wallet. The first advantage is portability, since you always have your phone with you, using the wallet is simple. You can’t take your computer anywhere with you, so from that point of view, mobile wallets are better. Also, if your phone has incorporated this features, you can scan QR codes in order to make payments in cryptocurrencies. Paying with mobile wallets is very simple, but since you also need to connect to the internet, a secure environment needs to be fostered. 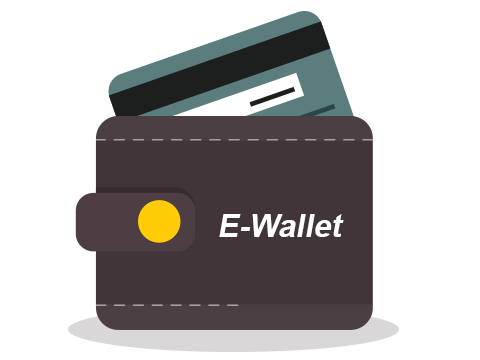 Online wallets – this type of wallet can be accessed via a web browser. Users do not need any kind of app installed on their computer or mobile phone in order to access an online wallet. However, in terms of security, this type of wallet has some weak points. Online wallets store your private keys online and are being controlled by third parties, which makes online wallets vulnerable to hacking or theft. Paper wallets – the term “paper” is just generic since there is no paper form of cryptocurrencies. It refers to a physical copy or printout for your private keys. Also, a paper wallet can also refer to a software used to generate a pair of keys, which should then be printed. Using paper wallets is very simple. You can transfer funds to it by simply transferring from your software wallet to your public address, written on the paper wallet. In order to spend the funds from the paper wallet you need to do the opposite – transfer the funds to your software wallet from the public address. Support for a single currency or more? Since bitcoin is the most popular cryptocurrency, 99% of the wallets available have support for bitcoin. However, it is possible that some of you would like to take advantage of other cryptocurrencies as well. Bitcoin is not the only one, there are other awesome cryptocurrencies that you could use due to fantastic features. If you do not want to stick just to bitcoin, choosing a wallet provider that has support for more is a must. It is important to find providers that have a diversified offer and services of high quality. Since any service costs money, you are probably wondering how much commission you’ll need to pay in order to use cryptocurrency wallets. As compared to the traditional banking fee system, when we talk about cryptocurrencies, fees are much smaller. That one of the main feature of a digital currency system– to facilitate the flow of digital money at low costs. Usually, when we talk about cryptocurrency wallets, you need to pay a fee that goes to the network miners. The miners are the ones who keep the system alive and they need to be paid somehow. Each financial transaction that is being processed in the system needs computational power so that the blockchain will be updated with the latest information. Miners are using their computational power in order to update the blockchain. Each cryptocurrency wallet provider has its own commission structure, but fees are much smaller, we can mention a medium of 0.12$ or 12 cents. Also, there are some wallet providers who let you choose how you would like your transaction to be processed. If you set a low priority to your transaction, it will take from a few hours to a few days until it will be processed, but the fee you will need to pay is much smaller. Having a cryptocurrency wallet means that you are anonymous? No, not at all. Look at a cryptocurrency wallet like a nickname for you. Keep in mind that all financial transactions are stored publicly and permanently on the blockchain. Even though your name and personal address are not stored on the blockchain as well, your wallet address can be traced to your identity in many ways. Some people think of cryptocurrency as a way to escape paying taxes. We do not advise you to do that. You can get involved in the cryptocurrency industry and pay your taxes as well. The returns are huge at the present time, so there is no reason for you to get greedy and break the law. Cryptocurrency wallets are a must if you want to use digital money. However, as we have described in this article, there are some key aspects which you must take into account if you want to benefit from using this type of wallet. Try to pay attention to every aspect we’ve mentioned and manage your cryptocurrency wallet properly. As always, focus on documentation before jumping in and choose something. The cryptocurrency industry is still under development and there are a lot of scammers in the market. Find out the serious companies that provide high-quality services. You have tons of reviews on our website as well, for hardware wallets and electronic wallets as well. It could be helpful for you to choose the best wallet provider.